It’s getting close to crunch time. There is so much learning to squeeze into the final months of school, and in a blink of an eye, it seems March turns into May. Right now, you could use a little magic in your corner. Well, grab some fairy dust for a sprinkle of free resources, chances to win classroom tools, and a freebie that can make your life easier! Bring magic and fairies—and free resources—to your students with The Never Girls series. Four modern-day girls, with a lot of luck and a pinch of fairy dust, come to magical Never Land. Perfect for grades 1–4, the books feature themes of adventure, cooperation and teamwork, friendship, and problem solving. Plus, at nevergirlsbooks.com, read about the author; watch videos; and get free activities, including poetry writing, number puzzles, and more. Need some cutting magic? Then enter to win $700 in educational die-cutting tools for your school. One lucky teacher will win the Mark IV School Starter Set, including a Mark IV roller die-cutting machine, a large school set of dies, and a die storage rack. The deadline to enter is March 31, 2015, so click here now! Introduce your preschoolers and kindergartners to the magic of the solar system. It’s part of the free online curriculum at ABCmouse.com/schools. When you cre ate a classroom account, you get instant access to more than 5,000 interactive learning activities in all major subject areas, including reading, math, art, science, social studies, and music; virtual field trips; and more! Click here to get started now! And first-grade teachers, a curriculum is coming for you soon. I hope you’ve saved a speck of fairy dust for some free shipping magic. Carson-Dellosa Publishing Group is offering free shipping for a year on any order over $35. 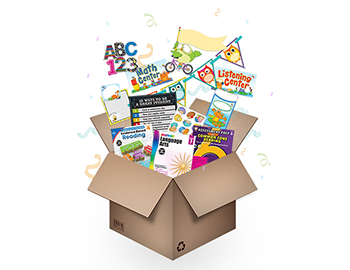 You can choose from more than 4,500 educational products, including grade-specific workbooks, classroom decoratives, games, and digital products. Plus, by signing up, you become eligible for exclusive offers. Get started here! Don’t forget; tell me which of these items is magical to you for a chance to win the books. Can I have that die cut machine? Pretty please with some fairy dust on top? I love the die cutting tools! I already have some girls in the room bugging me to get the Never Girl books. They love them, but I don’t have any yet. Ah, Brian, you must cave in soon…. 🙂 I’ve been reading them with my daughter and also will be making the purchase shortly! I have third grade students who may be interested in the Never Girls series. I am always looking for chapter books to introduce to the students I work with. Oh my goodness for a dye cut machine. Love the never girls too. It is all magical to me, but my favorite is definitely the Never Girls Series. There are many young readers in my school family that would enjoy to jump into the adventures of these fairies. I love having appealing books on hand to reward those who work hard and give it their best, or even occasionally seeing a struggling student. Gift of a book is a great confidence builder because it is empowering to them. Thanks! Twenty girls in my class just love fairies. They draw them and write stories about them. First I have heard of the Never Girl books. I teach 3rd grade in a school that has a population of 67% free and reduced lunch, so our socioeconomic status is different from most. I also have only 5 girls in my room, and I’ve moved down from teaching 5th grade. I’d love to get the Never Girl books. With next week beginning our statewide test (ISTEP+), the fairy dust has given me an idea…each morning when the students arrive (my classroom is by the doors that students come in from the buses), I am going to get out my bubbles and “fairy dust” them for brain-power. They will love it and I know look forward to coming to school each day to test. The die-cutting machine would be great help to our daycare. I would love to win the Mark IV School Starter Set. My school is the farthest away from the curriculum lab in the district office (about 10 miles) and it is the opposite direction from my house. Having these tools on my campus would be WONDERFUL!! I would love to win the die cut set. It would be a big help in my classroom and other teachers’ classrooms. I would love the die cut set! I would love to win the Mark IV School Starter Set. I work at a brand new school, and we have a very limited number of die-cuts. That die cut set is really cool! What a great resource for the school to share!